Elegance on a grand scale ! 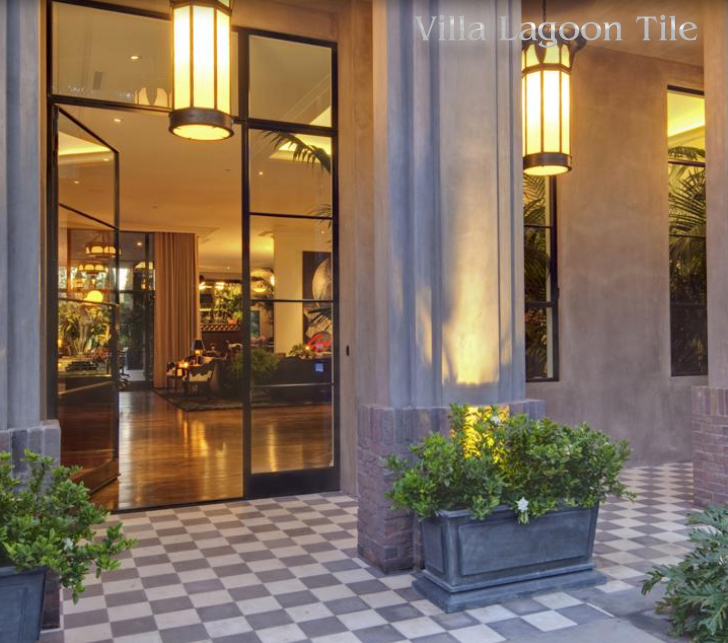 We were thrilled to have our tile in this Los Angeles 10,000+ square foot personal paradise. We were approached early on by the developer / designer to be a part of a major home renovation and I can truthfully say they were a pleasure to work with and everything went smoothly on this unusually large residential tile delivery. On the expansive patios the Gray and White check tile continues. Designer Kristoffer Winters used our Cubes tile in the kitchen and adjacent living area in this uber swank mansion. He told me that they added a dash of raw umber tint to the sealant to give the tile an aged look. 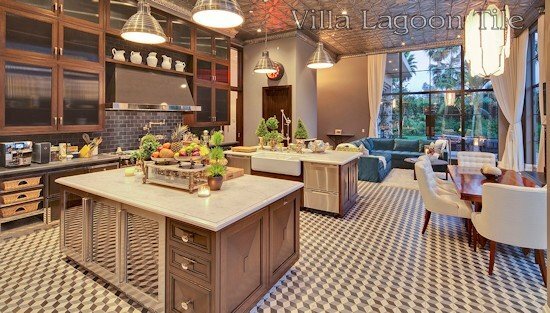 They were thrilled with the result and he said most people assume that the porch cement tiles are an original part of the home. We are looking forward to Kristoffer’s appearance on Bravo TV’s “Million Dollar Decorators” show. Maybe he will mention our tile !! Cubes cement tile floor in front of a La Cornue range, cabinets and vent hood. The Los Angeles Times Business Section featured the sale of The Reserve, August 24, 2013. Winters and The Reserve were featured in a Bloomberg article, August 16, 2013. The Reserve was highlighted in the popular design blog, COCOCOZY, July 8, 2013. Kristopher Winters appeared in a feature about The Reserve on an E! program, “A-List Listings”, May 20, 2013. A feature on The Reserve appeared in Variety, March 26, 2013. Blog post on a mention of The Reserve in the Robb Report, March 22, 2013. Blog post on Curve Improvement about The Reserve, March 12, 2013. The Reserve is listed as a notable residence on the Holmby Hills page of Wikipedia.